Being a parent is an overwhelming and thankless job. Parenting a child with special needs brings an entirely different set of challenges and successes. It is easy to feel alone and inadequate. It is difficult to admit that you cannot control everything. Let’s be honest: It is difficult to admit that as a parent of a child with special needs, you can control very little. The ups and downs of parenting a special needs child for the past 13 years have taught me some important lessons. 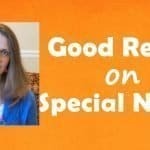 Here are some tips I have for parents of special needs children. Special needs children do things in their own way and in their own time. Small steps can be a great accomplishment for both the child and the parents. When we are in the trenches, this can be difficult. However, by taking a step back, we can see how far we have come and the great blessings we have. When I think back to when our daughter was a baby, I remember the doctors telling us all of the things they thought she would never be able to do. She is able to do most of those things now. We recently watched some home videos (which our daughter watches over and over). It was such a great reminder of the strides we have all made in this journey. It also keeps me motivated remembering the hurdles we have jumped together. Learning your child has special needs is disheartening to say the least. It is natural to grieve for the hopes and dreams you once had for your child which will never become reality. The thoughts of what the future holds for your child, along with what that means for you, can be daunting. While I have dreams of spending our retired years traveling and pursuing our own interests, I don’t know if our daughter will be capable of getting along without us. Beyond that, I worry about my sons taking on the responsibility of taking care of their sister after we are gone. We cannot spend our lives wishing for what might have been. We have been blessed with the gift of a special child who will help us become much better than we could possibly have been without her. Accepting the child’s special needs and accepting the child for who he or she is, the good and bad traits alike, will allow us to help our child to achieve success, no matter how big or small it may be. Focusing on children’s good traits will encourage them to keep trying to improve. Being a sibling to a special needs child can be a burden. Often we as parents get so wrapped up in helping our special needs child that the other children feel neglected. Our boys have told us several times that we spend way more time with their sister than we do with them. There is probably some truth in that. However, as we have become more aware of this, we have made a more conscious effort to give them better attention. Additionally, the typically developing children deal with the social implications of having a special needs sibling. One day our son (who was 8 at the time) came home from school very upset because other children on the school bus were making fun of his older, special needs sister. Our daughter is often unaware of the teasing and snide remarks other kids make. Day after day, our sons witness the ridicule directed at their older sister by her teenage peers. Our boys have expressed that they have been scared to stand up to the older, bigger kids who are unkind to their sister. I wish there were an easy answer to help these siblings cope with the burdens they face. In my experience, one of the best ways to help is by being open and honest. 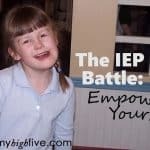 Helping the siblings better understand the situation and the special needs can give them a better picture of what is going on and what they might be able to expect going forward. 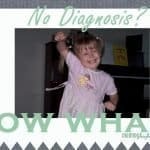 Parenting a child with special needs is not for the faint of heart. It comes with incredible frustration as well as emotional, mental, and physical exhaustion. Becoming run down and angry can happen quickly. It is so helpful to take a break and get away from the situation, even for a short time. Make plans ahead of time so you can take breaks regularly. Find someone else to take care of your child while you get away for a while or do something as simple as taking a nap. Of course you aren’t comfortable leaving your special needs child with anyone. Family members, friends, neighbors, or parents of other special needs kids can be possible sitters. If you’re like me, sometimes you feel guilty leaving your special needs child. After I take a break, though, I realize that taking breaks helps my entire family. It gives me the chance to recharge and be a better mom and wife. Admitting that you cannot do this on your own is not a sign of weakness. I have spent a lot of time trying to do it on my own, but I fell on my face and couldn’t get up. My mom once told me that I need to allow other people the joy and blessing of getting to know my child by spending quality time with her. Last year our autistic daughter was old enough to go to girls’ camp. I had the hardest time letting her go. I worried about who would comb her hair every day, who would remind her to wipe her face at dinner, and I worried about how she would take care of her bed-wetting without me there. I considered driving up every morning and dropping our daughter off and then driving back to get her every night so I could make sure she was taken care of. However, after speaking with my wise mother, I decided to let our daughter go for the entire four days. I spoke with the camp leaders, and they were willing to take special care of our daughter. Thankfully, I was able to communicate with the leaders via text while they were at camp. There was no need for my worrying. Our daughter had such a great time at camp, she cried when she came home because she wanted to go back. The leaders told me of the great lessons they and the other girls had learned from our daughter during their few days together. After trying numerous different products, medications, and sleeping arrangements for our daughter, we finally came across an advertisement for a weighted blanket. After researching some more about weighted blankets, I knew I wanted to try one for our daughter. There was a bit of sticker shock when I saw the price, but I was ready for her to have some good sleep. Weighted Blankets have been a great help in our family. Having your special needs child go to sleep and actually get sleep can make all the difference in the world. 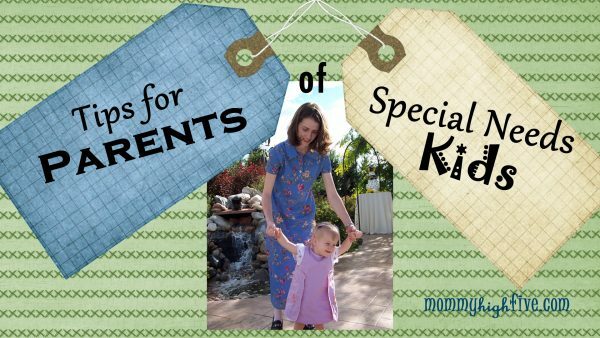 Parenting a special needs child can be a rewarding and life-altering experience. Navigating these parenting waters can be difficult, though. I have learned that life will continue to throw curve balls, but these tips have helped me to keep my head above water. You can do this! Find strength in knowing we understand some of the struggles you are experiencing, and we are here for you. Please share any other tips you have by emailing [email protected] with the subject line Special Needs.